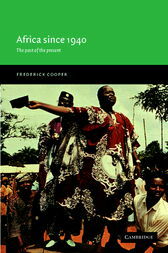 Frederick Cooper's book on the history of decolonization and independence in Africa is part of the textbook series New Approaches to African History. This text will help students understand the historical process out of which Africa's position in the world has emerged. Bridging the divide between colonial and post-colonial history, it allows readers to see just what political independence did and did not signify and how men and women, peasants and workers, religious leaders and local leaders sought to refashion the way they lived, worked, and interacted with each other.